WOW, the world sure changes fast if you close your eyes! OK after one of my readers left a comment suggesting that the new version of Nik’s HDR EFX Pro 2 was likely supported in Lightroom I decided that I should perhaps do a little research! 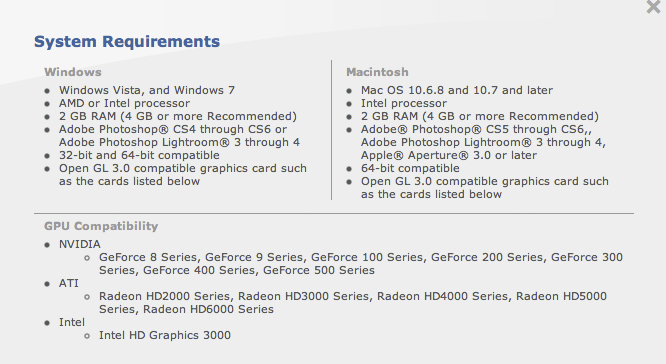 So, as you see, as long as you are running a 64 bit OS plus very specific hardware in the graphics department it seems as if you can now run this fine HDR tool in Lightroom and Aperture! The Nik tools have always worked in Lightroom and Aperture. The installation package senses which apps you have installed and installs the correct version of the product, also will install 32bit version or 64bit version as required. When you download the product or upgrade, don’t forget to check not only OS but which host apps you have (LR, aperture, photoshop). It has always worked this way, buddy! Donald, yes that is true for all of them EXCEPT for HDR EFX Pro. That one particular tool would not work on the earlier versions of Lightroom and it required the 64 bit OS. I have been running NIK HDR Efex Pro for a couple of years on 32-bit Windows Vista as a “stand-alone” program because it will not integrate with Photoshop Elements 7. I am now running it on my Windows 8 64-bit laptop and it does run much faster than on 32-bit Windows. Larry, have you tried the new version yet? It is MUCH better! Yes, in fact it was only last week that I finally got rid of the 32-bit versions of both LR and PS. I checked all of my plugins and all of them except one has released the 64-bit version. For that one, and I won’t name the provider, I will just have to do without for a while but keeping 2 versions updated is getting to be too much!! Donald, boy do I EVER understand where you are comming from! It is really hard to keep up with OS versions then software on top of it all! Did you upgrade to Mountain Lion yet? I did and everything installed correctly for me… Lucky!